Blue mid size Rustic vase. 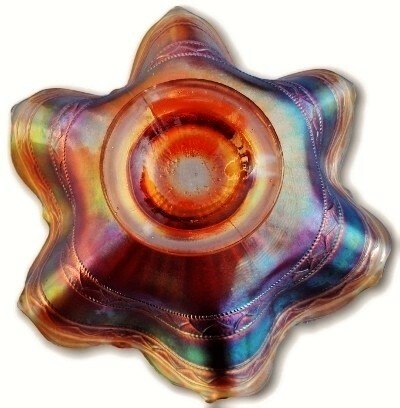 Measures 16 1/2" tall 5 1/2" across the top and 4 1/2" across the base. 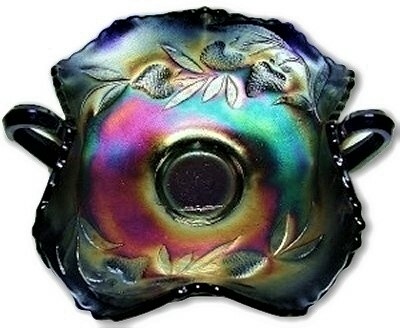 Exceptional iridescent finish. No chips, cracks or repairs. 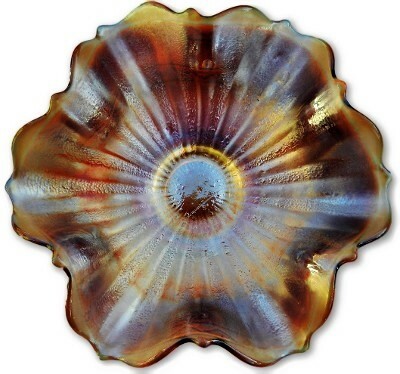 Stunning cobalt blue standard Rustic vase. Standing 10 1/8" tall and 3 1/4" across the base. 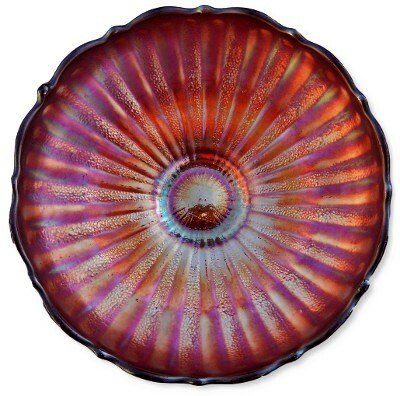 This item has a wonderful and very colorful finish both inside and out. No chips, cracks or repairs. 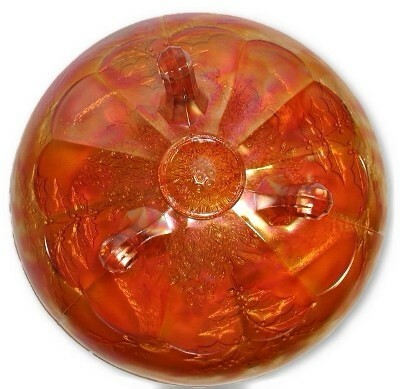 Marigold radium finish mid size Rustic pattern vase. 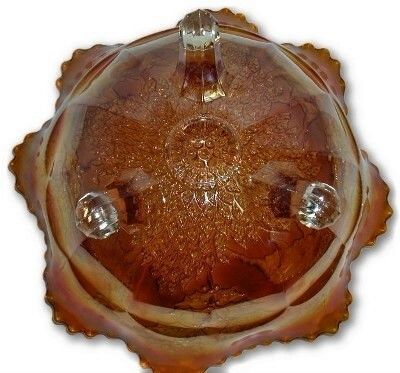 The base measures 4 1/4" across, stands 16 5/8" tall and 5" across the crimped top.No chips, cracks or repairs. Frosty white standard Rustic vase. 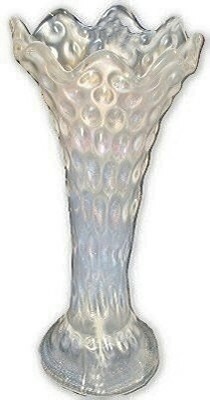 This item has one of the best frosty white finishes. Standing 9 1/8" tall, 4" across the top and 3 1/4" across the base. No chips, cracks or repairs. 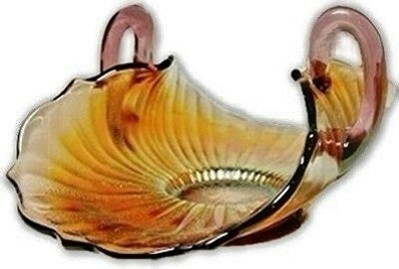 Fenton Sailboat with the Orange Tree back pattern amber base glass with brilliant marigold iridescent finish. 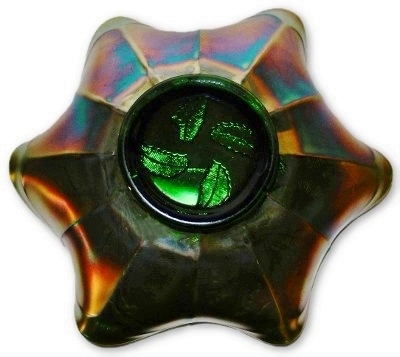 The Marie glows green when held to a black light. 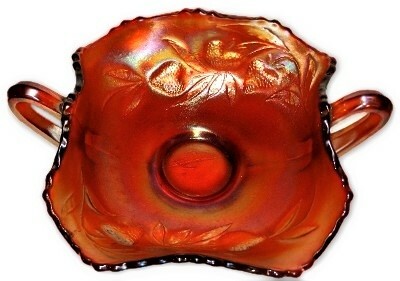 Measures 5 1/2"X 1 3/4" . No chips cracks or repairs. 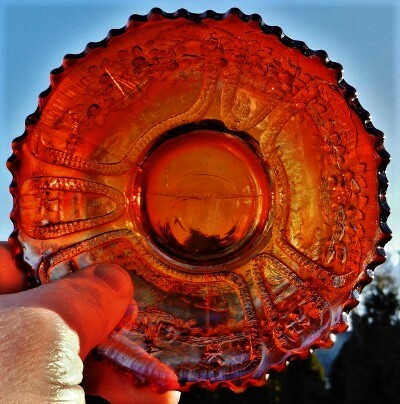 Rare Fenton Sailboat pattern bowl with the Orange Tree back pattern. 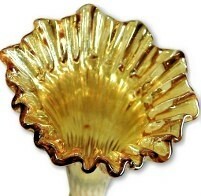 Measures 5 1/2" X 1 3/4". No chips cracks or repairs. 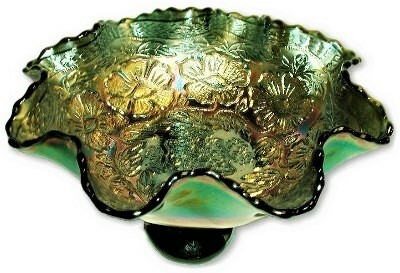 Alaskan green & marigold Smooth Rays pedestal foot bowl. 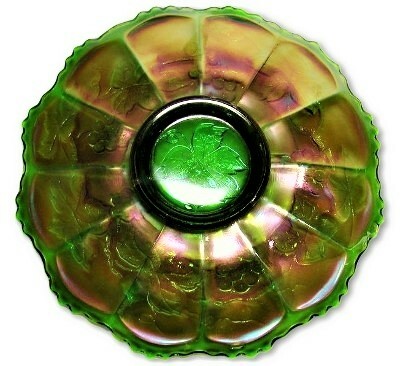 The glass has a strong green tint that turns bright green when held to a black light. Measures 5 3/4" X 2". No chips, cracks or repairs. 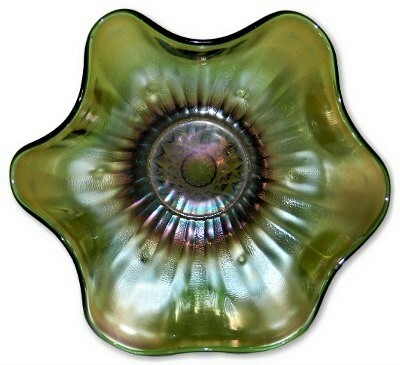 Uranium glass radium finish Smooth Rays tri corner plate. 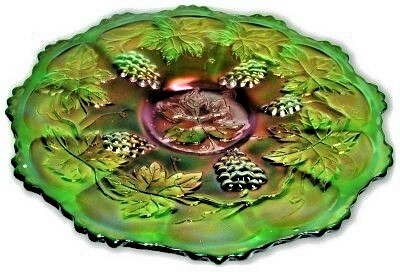 This is made of very reactive to black light (glows bright green all over) Vaseline/uranium glass and is covered in a glossy green radium finish. Measures 6 1/2" X 2 3/4". No chips, cracks or repairs. 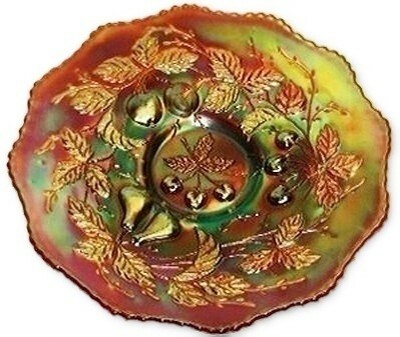 Marigold Stag and Holly centerpiece bowl. The marigold color boarders on pumpkin. Measuring 9 1/2" across and 5" high. No chips, cracks or repairs. 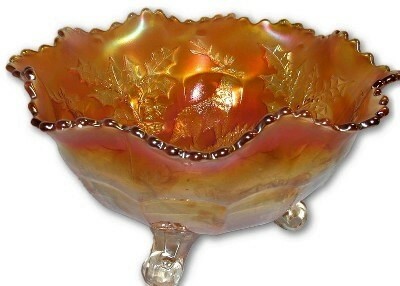 Brilliant marigold STAG and HOLLY ice cream shape large footed bowl. Measures 10 1/4" X 3 1/4". No chips, cracks or repairs. 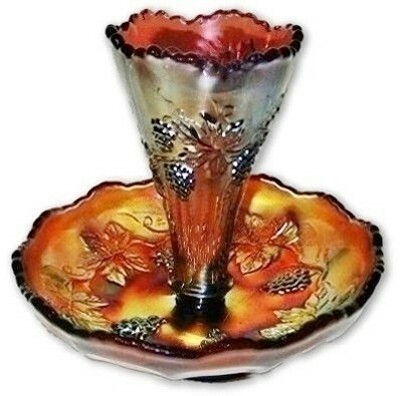 Dark marigold Stag & Holly Large 3 Footed ice cream shape centerpiece bowl. Measures 10 1/2" X 3 3/4". No chips, cracks or repairs. Lavender STIPPLED RAYS 2 handled and 2 side up bonbon card tray. 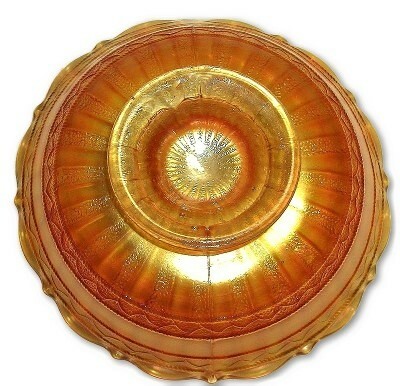 The base glass color as you can see is the most beautiful lavender and the interior is covered in a brilliantly iridescent rich marigold finish. Measuring 7 1/2" X 2 1/2". No chips, cracks or repairs. 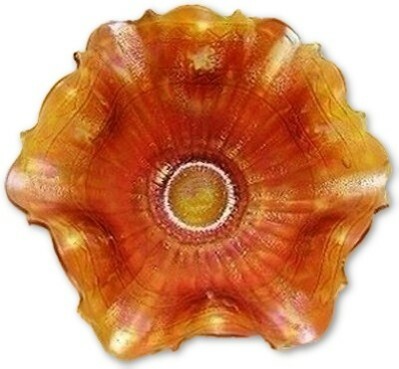 "STIPPLED RAYS & SCALE BAND"
Amber glass Stippled Rays/Scale Band ruffled and footed bowl. This item measures 7 X 2 1/2". No chips, cracks or repairs. 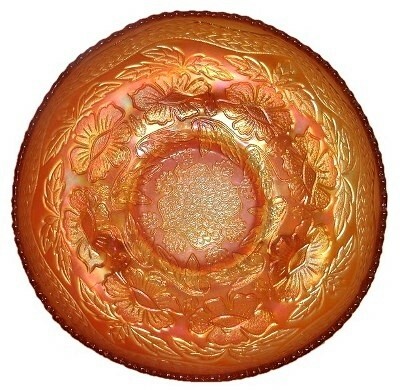 Pumpkin finish over amber glass Stippled Rays/Scale Band footed bowl. This item measures 5 3/4 X 2 1/4". No chips, cracks or repairs. 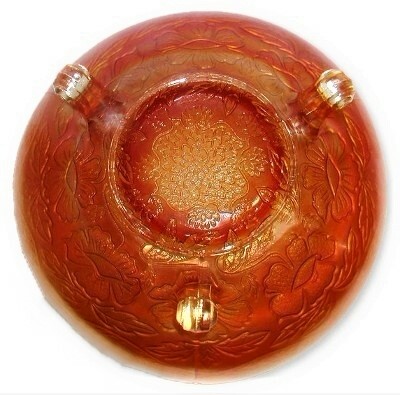 Outstanding brilliant Red on Red Amberina ice cream shape bowl. Measures 6" X 2 1/4". No chips cracks or repairs. 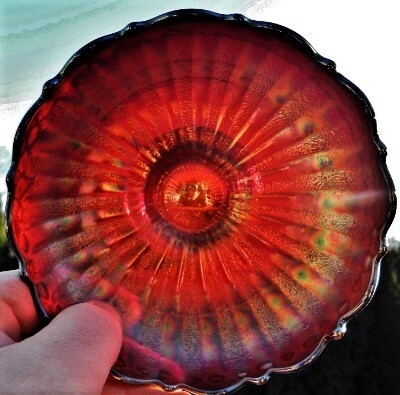 Cherry red amberina carnival glass Stippled Rays/Scale Band footed ice cream shaped bowl. 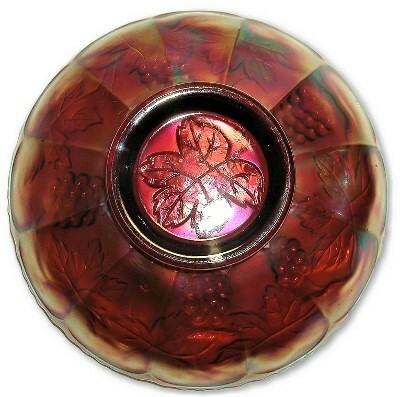 The iridescent finish is red as well as having the finest Red Amberina we have ever owned in this pattern. Measures 6" X 2". No chips, cracks or repairs. 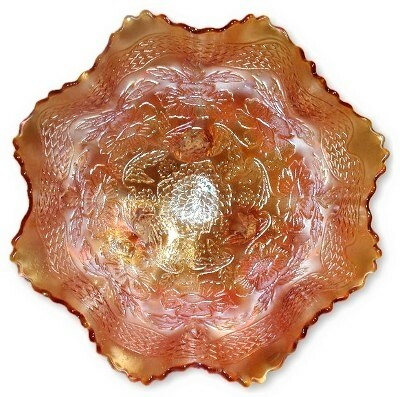 Fenton Stippled Rays with Scale band exterior reverse amberina ruffled bowl. 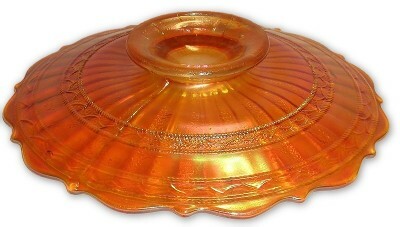 Measures 7" X 2 1/4". No chips, cracks or repairs. 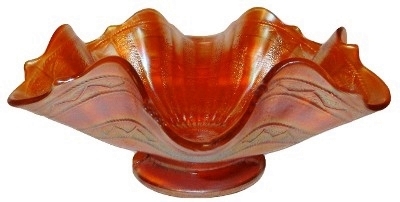 Spectacular Fenton Stippled Rays with Scale band exterior double reverse amberina ruffled bowl. 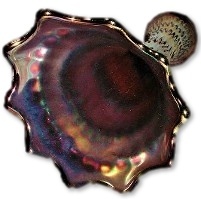 Measures 7" X 2 1/4". No chips, cracks or repairs. 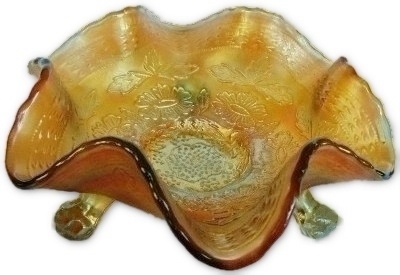 "STIPPLED RAY & SCALE BAND"
Marigold Stippled Rays & Scale Band footed bowl. This item measures 6 1/4" X 2". No chips, cracks or repairs. 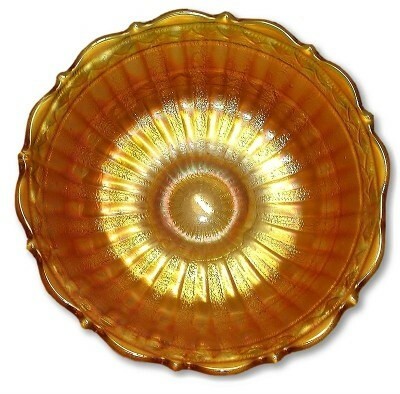 Fenton Stippled Rays with Scale band exterior dark marigold ruffled bowl. Measures 6 1/2" X 2 1/2". No chips, cracks or repairs. 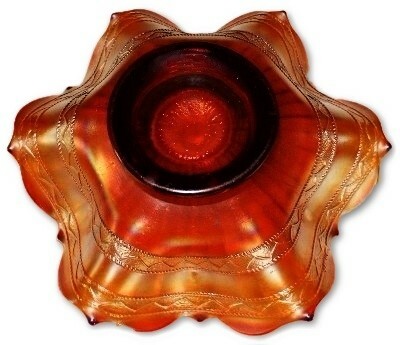 Brilliant Fenton Stippled Rays with Scaleband exterior ruffled bowl. 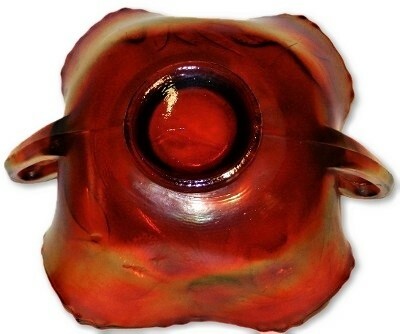 This item has a fantastic radium cherry red iridescent finish over a cherry red slag glass body. 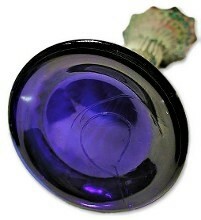 Measures 7" X 2 1/4". No chips cracks or repairs. 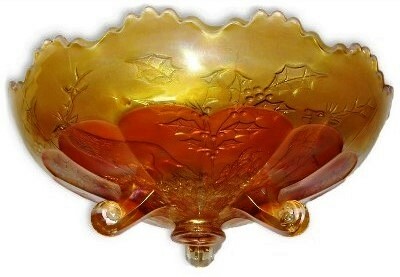 Scarce sapphire blue & dark butterscotch Stippled Ray with Scale Band ruffled bowl. 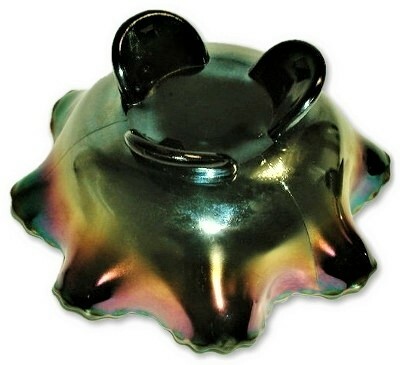 This item measures 7" across and sits 2 1/2" tall. 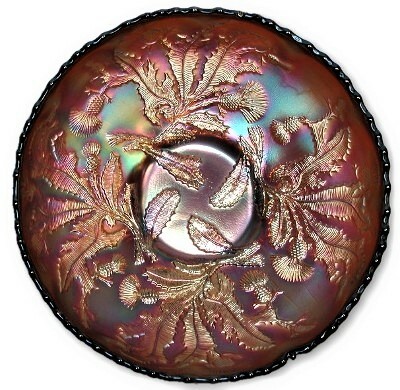 Stunning multi colored iridescent finish will make this a fantastic addition to any collection. No chips, cracks or repairs. 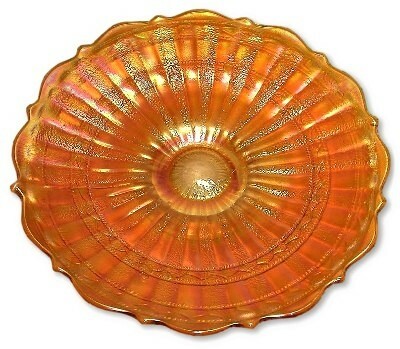 Marigold Stippled Rays & Scale Band flat plate. This item measures 7" X 1 1/8". No chips, cracks or repairs. 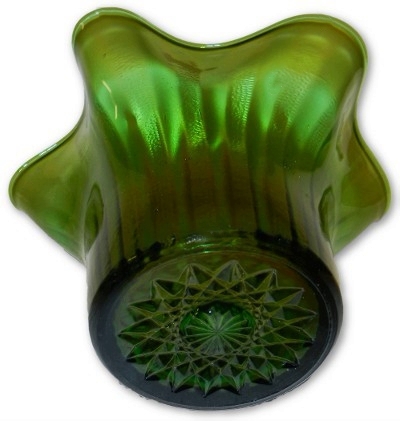 Green STIPPLED RAYS with STAR base ruffled hat shape vase. This item measures 5 1/2" X 3 1/4". No chips, cracks or repairs. 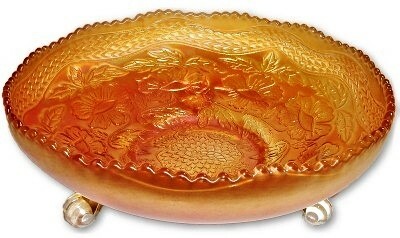 Amber STRAWBERRY 2 handled bonbon card tray. This item measures 7" X 6" X 2". No chips, cracks or repairs. 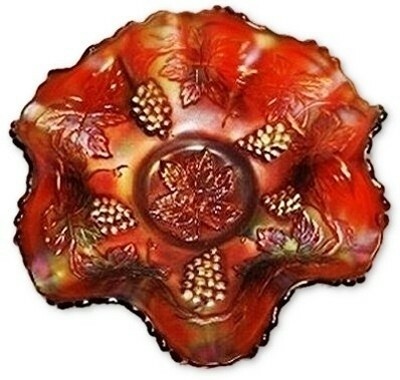 Fenton brick red amberina STRAWBERRY 2 handled bonbon card tray. 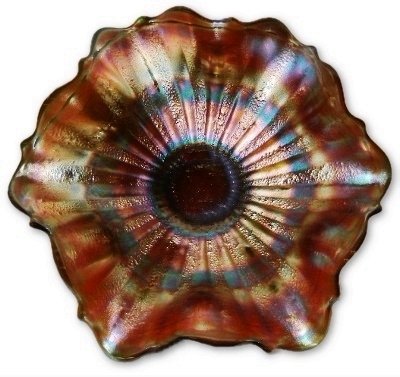 This item measures 6 1/2" X 6" X 2 1/4". No chips, cracks or repairs. 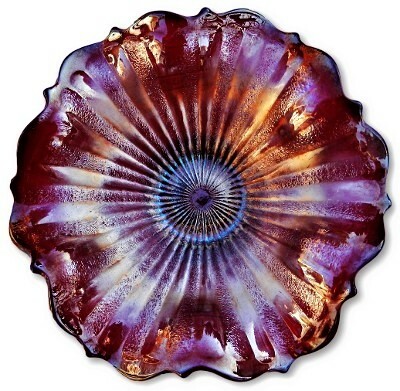 Cobalt blue STRAWBERRY 2 handled bonbon card tray. 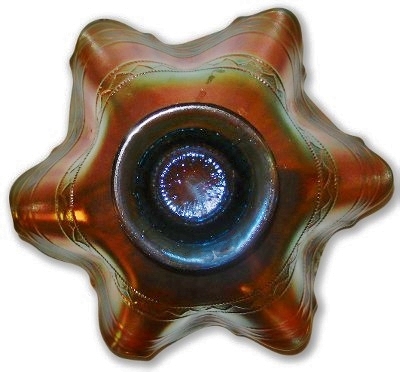 This item measures 6" across at the widest point and sits 2 3/4" high. No chips, cracks or repairs. 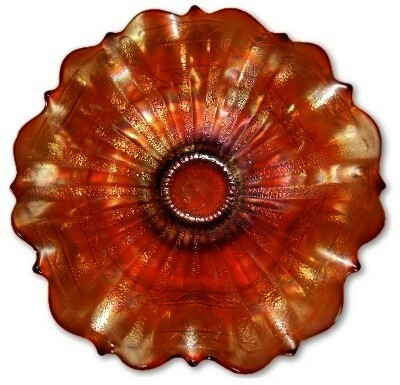 Marigold STREAM OF HEARTS & PERSIAN MEDALLION ruffled and crimped compote. Measuring 6 1/2" X 6 1/2". No chips, cracks or repairs. 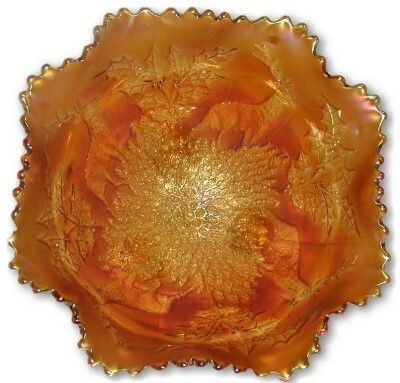 Marigold STREAM OF HEARTS & PERSIAN MEDALLION ruffled compote. Measuring 6 1/2" X 6 1/2". No chips, cracks or repairs. 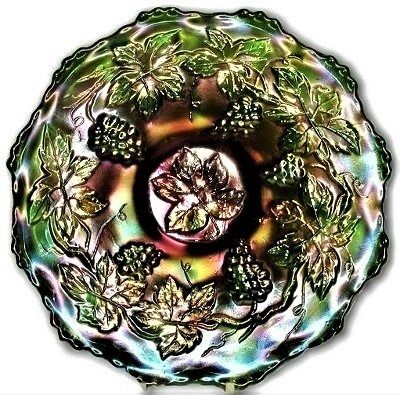 Amethyst Thistle pattern ice cream shape bowl. 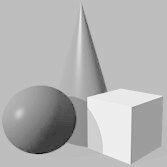 A small in the making edge sharp birth mark can be seen at the 5 o'clock position of our image. 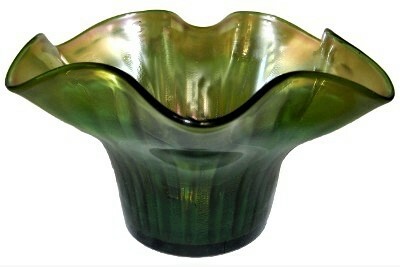 Measures 7 7/8" X 2 3/8". No chips, cracks or repairs. 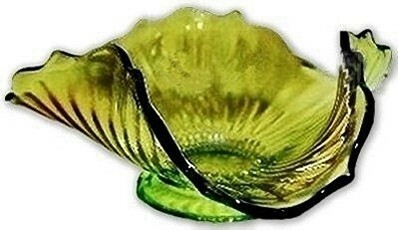 Fenton "Thistle" green ruffled edge bowl. 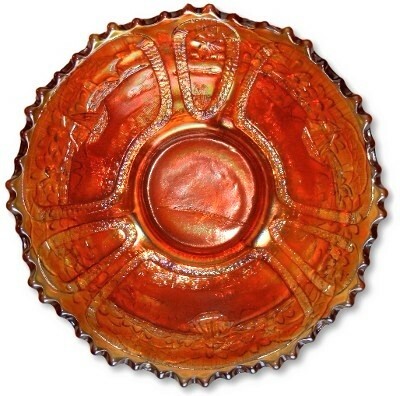 Measures 9" X 2 1/2". No chips, cracks or repairs. 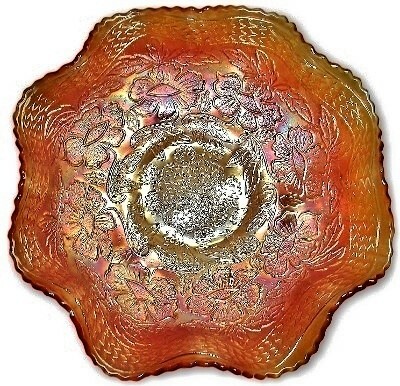 Fiery amethyst Three Fruits plate. 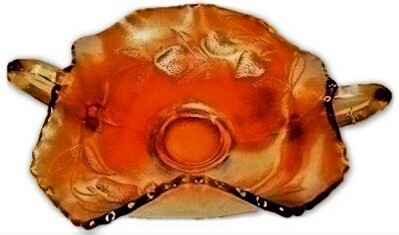 Normal wear to the raised fruit. Measuring 9" across and sitting 1 1/2" high. No chips, cracks or repairs. 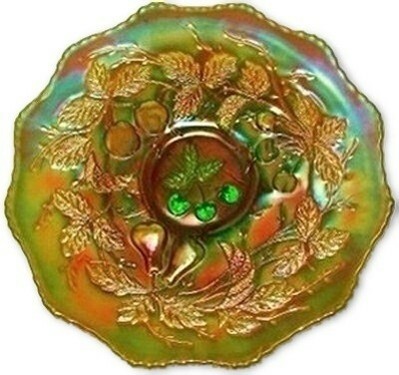 Green THREE FRUITS 12 sided plate. 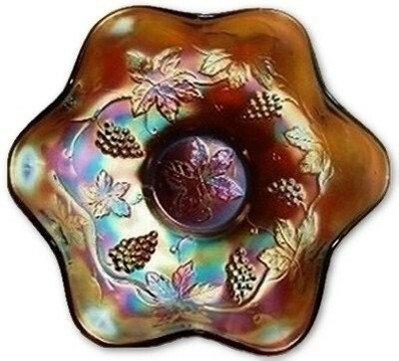 This item has above average colorful iridescent finish while some of the cherries appear to have not had the iridescent finish adhere during the manufacturing process. 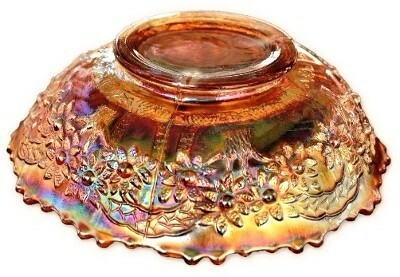 Only minor wear to the raised fruit. Measures 9 1/2" X 1 1/2". No chips, cracks or repairs. 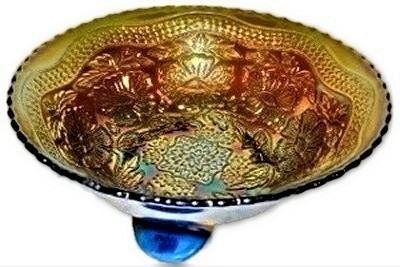 Blue TWO FLOWERS ice cream shape (ICS) spatula footed bowl. 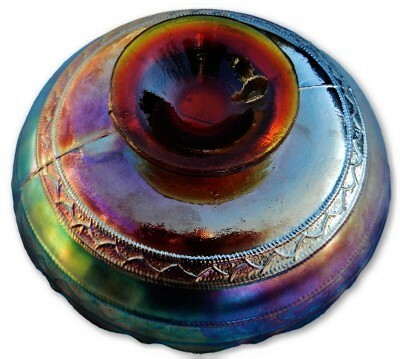 The blue glass is closer to sapphire blue while the interior iridescent finish is a colorful butterscotch. 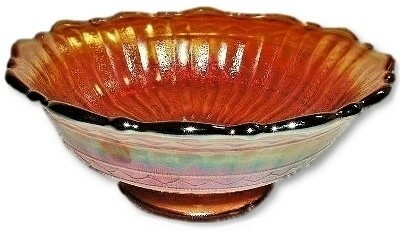 This bowl measures 7 1/2" X 3 1/4". No chips, cracks or repairs. 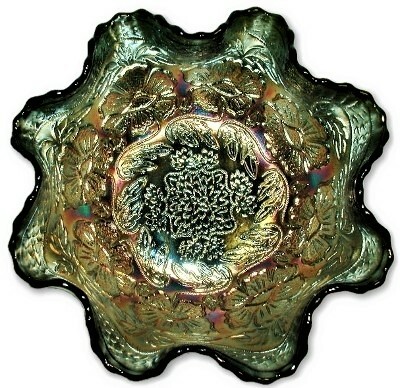 Green Two Flowers spatula footed bowl. 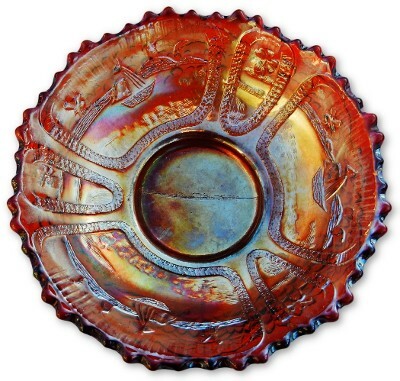 Measures 8" across and sits 3 1/2" high. No chips, cracks or repairs. 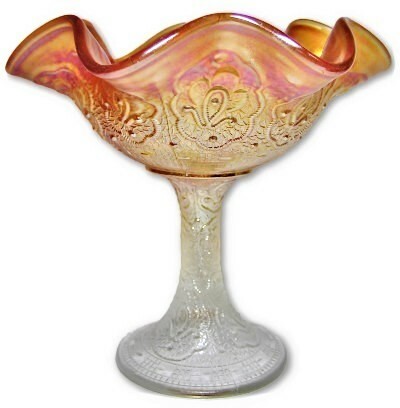 Marigold ice cream shape Two Flowers large 3 ball footed bowl. Measures 8 3/4" X 3 1/4". No chips, cracks or repairs. 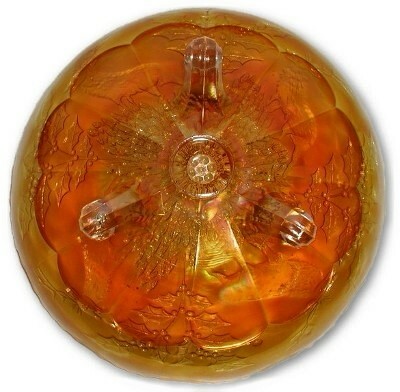 Dark marigold 2 Flower 3 footed bowl. This item measures 10 1/2" X 3". No chips, cracks or repairs. 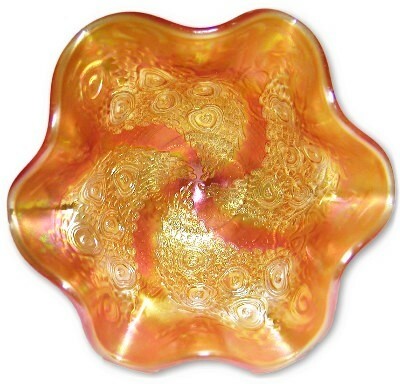 Marigold Two Flowers 3 ball footed centerpiece bowl. 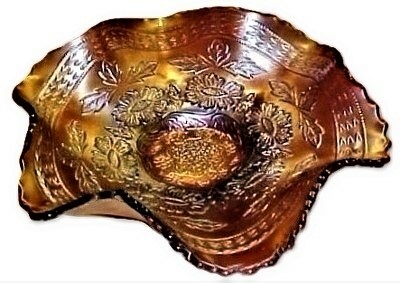 Measures 10 3/4" X 4 1/2". No chips, cracks or repairs. 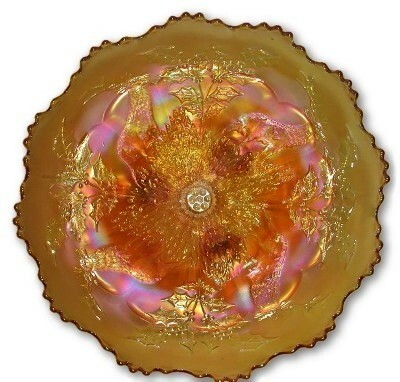 Fenton "Two Flowers" pattern amethyst scarce collar base and ruffled sauce dish. Measures 6" X 1 3/4". Sits slightly uneven on a flat surface. No chips, cracks or repairs. 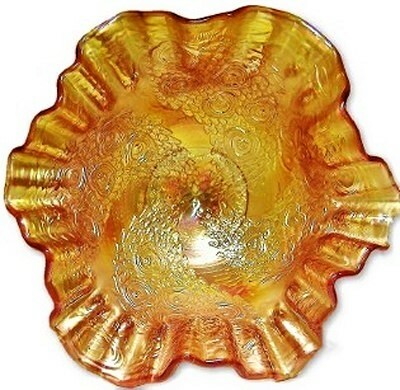 TWO FLOWERS pattern ruffled 3 scroll footed sauce dish. 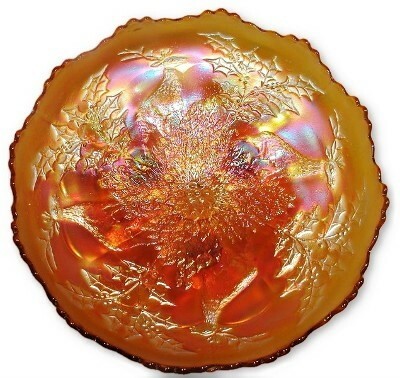 Base glass of Vaseline uranium covered in a rich marigold iridescent overlay. Measures 5 3/4" across and sits 2 5/8" high. No chips, cracks or repairs. 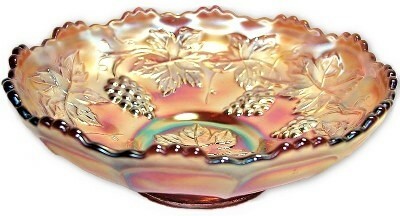 "VINTAGE" Grape pattern ice cream shape bowl. Measuring 6 1/2" X 2". No chips, cracks or repairs. 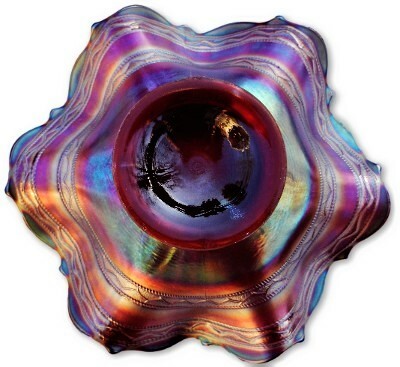 "VINTAGE" Grape pattern fiery amethyst ruffled bowl. 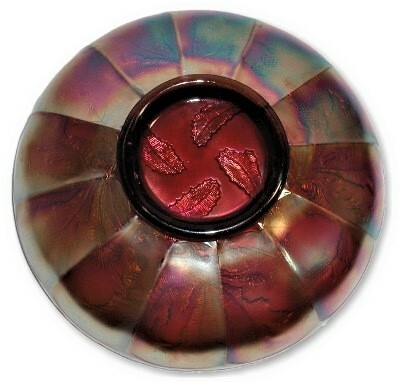 This item has a superbly rich red iridescent finish. 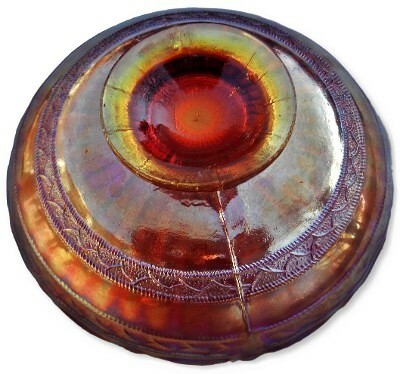 The base glass color is 95% reddish/amber with only the collar base rim showing any hing to amethyst. 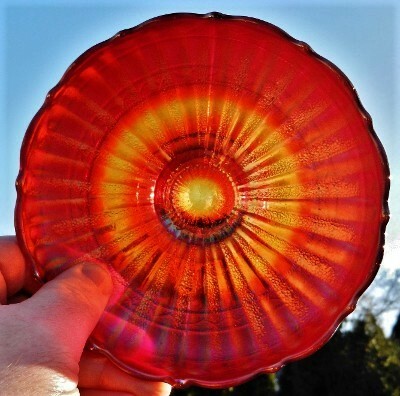 Measures 7" X 2 1/4". No chips, cracks or repairs. 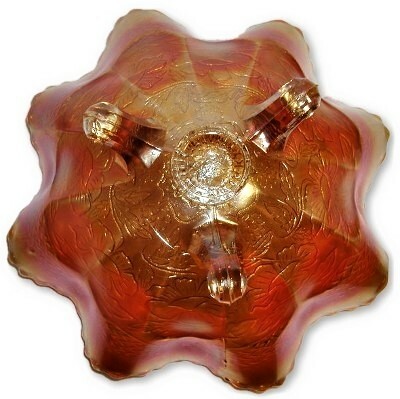 Amethyst ruffled VINTAGE pattern bowl. Measures 9" X 2 3/4". No chips, cracks or repairs. 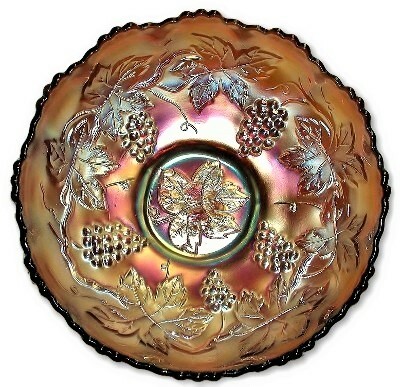 "VINTAGE" (Grape) amethyst small size epergne. Measuring 4 3/4" high while the bowl base measures 5 1/2" across. 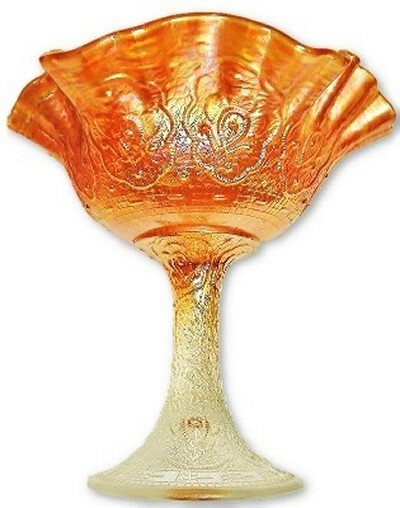 As is very common for the 2 piece epergnes, a small 3/8" flat clam shell flake/chip under the lily which is minor and does not show at all when the lily vase is in place. No other chips, cracks or repairs. 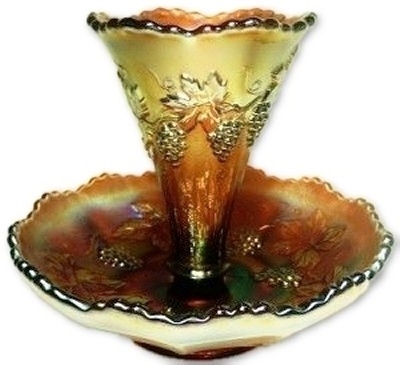 "VINTAGE" (Grape) amethyst small size epergne. Measuring 4 3/4" high while the bowl base measures 5 1/2" across. 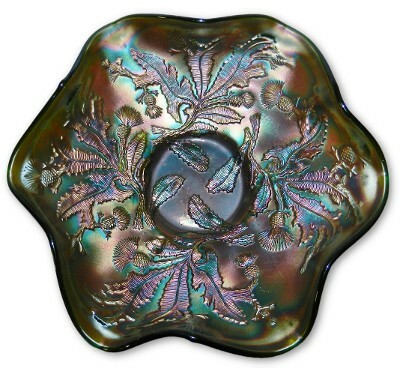 The bowl has an excellent iridescent finish while the lily is a bit on the silvery iridescent finish side. 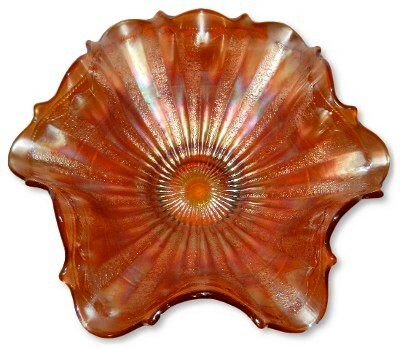 As is very common for the 2 piece epergnes, a small 3/8" flat clam shell chip and several other flakes and flea bites on the portion of the lily that fits into the bowl. 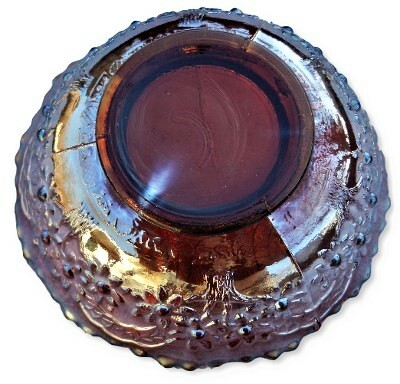 A very tiny spot of pot ash can be felt on the rim of the bowl from the manufacturing process. No other chips, cracks or repairs. 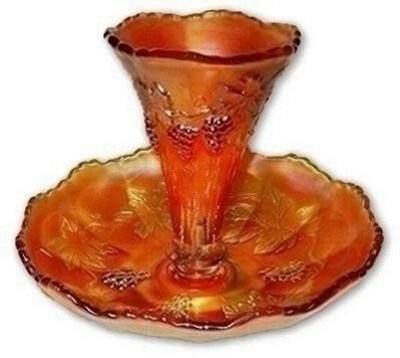 "VINTAGE" (Grape) pumpkin small size epergne. Measuring 4 3/4" high while the bowl base measures 5 1/2" across. 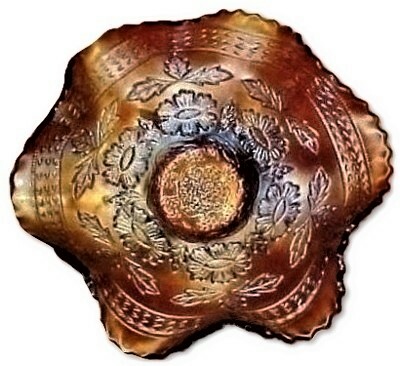 As is very common for the 2 piece epergnes, chips under the lily as well as some chipping around the ring of the lily insert. No cracks or repairs. 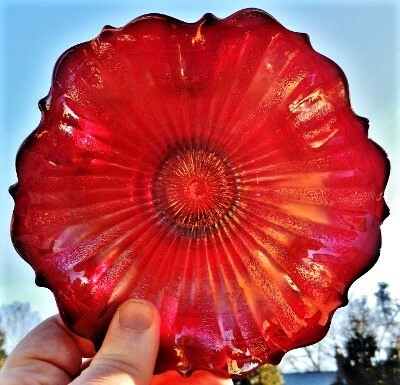 "VINTAGE" Grape pattern 3 foot fiery amethyst fernerie. 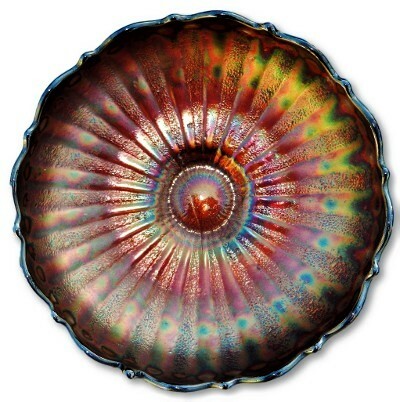 Excellent color and wonderful iridescent finish. Measures 6 1/2" X 3 1/2". A few tiny flea bite flakes on the high point of one foot. No other chips, cracks or repairs. 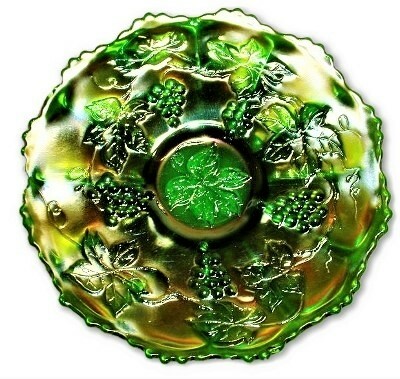 Green Vintage pattern plate. Measuring 7 1/2" X 1 1/2". No chips, cracks or repairs. 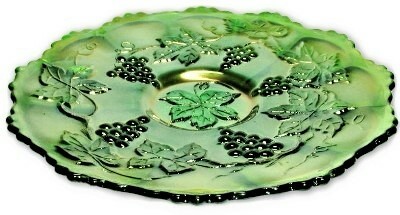 Green Vintage pattern plate. Measuring 7 1/2" X 1 1/8". No chips, cracks or repairs. 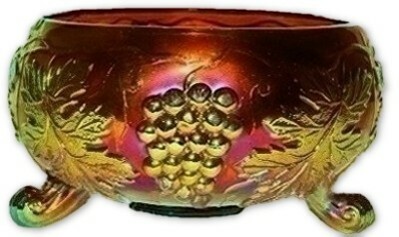 Scarce blue Wine & Roses goblet. Measures 5 1/2" tall. No chips, cracks or repairs.